I was one of the 12 lucky people who had the chance to ride with the Atherton’s courtesy of Vito Sport in Llandegla, North Wales. I was ecstatic when my friend Joanne messaged me on Twitter to say she had won and asked if I would like to come with her. I jumped at the chance; I couldn’t believe she had asked me! The night before I barely slept, a mixture of Red Bull, nerves and excitement coursed through me. The morning of the experience day, Joanne and I left the house a bag of nerves. It was a grey day in Stoke-On-Trent, so we both hoped it would be a different story once we crossed over the border into Wales. When we pulled into the car park of Llandegla Forest I felt sick with nerves, not because of the biking, but because I was about to meet the Atherton’s. I made my way into the reserved area with Joanne and stood in the corner like a rabbit in the headlights. Too terrified to move I saw Dan walk in my direction, he shook my hand and instantly made me feel at ease. Rachel soon followed and we began to chat. I don’t often get starstruck, but the Atherton’s are amazing, they have been through so much and they are still doing what they love, I admire that so much. I was handed a bacon roll and a cup of tea, but was too nervous to eat, it was all so dreamlike. We were soon told what the day had in store: we would be going out on an XC ride, a few of us had brought downhill bikes, but thankfully the trail centre gave us some of their hire bikes to use for the day. 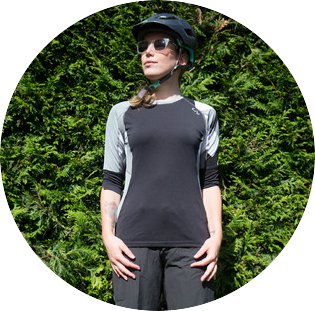 I have never been on a cross country ride before, let alone sat on a XC bike, everything felt so strange compared to my downhill bike, but Rach looked over the bike with me and I was ready to go. It was a daunting experience at first, I hadn’t eaten, I was on my first ever XC ride (with the Atherton’s) I was nervous, and the bike felt quite alien. It was all completely different, I was completely out of my comfort zone, but I had a big grin on my face. Rachel stayed back with the girls, there were only three of us and guys to went on ahead. Angus came along for the ride too, and ran beside the bikes keeping a watchful eye on Rach and darting in between everything. The first climb was a hard work, the headwind hit us full force, the climb was open and around four miles long, but we were soon back in the shelter of the trees. We met up with the guys and the Vito van at the top of the climb, everyone was waiting there and the atmosphere was really lively. A few of us decided to go on the red route, with a few opting for the blue. I decided to go on red, not knowing what I was in for, but I am sometimes too determined and stubborn for my own good. Riding with Rachel was amazing; she was supportive and even gave me some great tips on how to corner more effectively. I gradually began to relax, and was really enjoying the trail. There were some great features, nice swooping downs, little drops, with the odd bit of northshore. I didn’t enjoy the ups so much, but I’m not used to them so I found it hard. Once we’d reached the woods again the Vito van and photographers came to get some pictures of Rachel as she glided effortlessly down the trail. 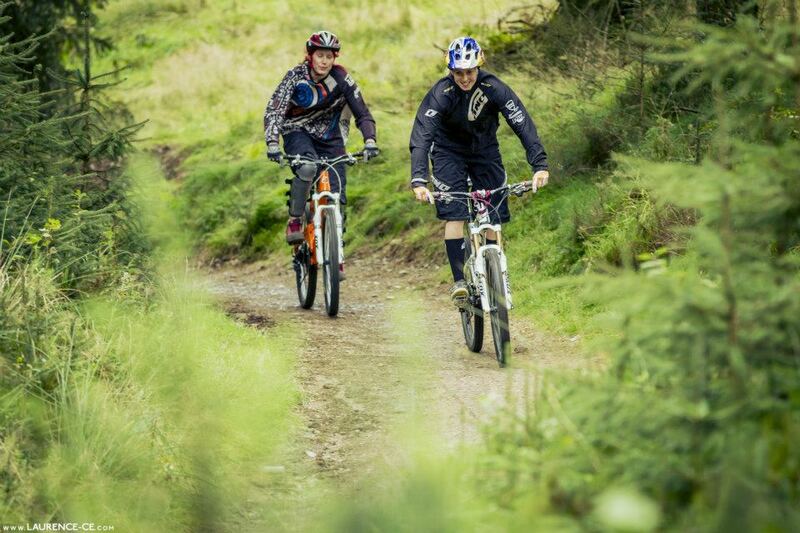 It was such a surreal experience; I was riding along with Rachel Atherton, and her dog Angus! Everyone was having a great time despite the grey skies. Once the day went on everyone was more relaxed, we all had big smiles on our faces and continued along the red route chatting away as if it was just another ride with a group of friends. 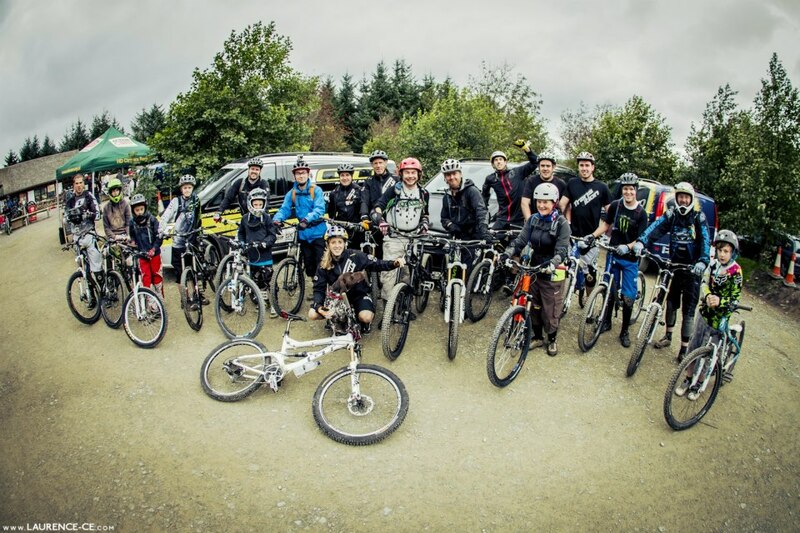 There was a good mixture of people on the day, it doesn’t matter what age you are when mountain biking is involved, we all come together to do something we love. After a few more ups (and not enough downs) the group met in the trail centre for lunch. Everyone sat around talking about their ride and how the day was going. We were given lunch which was really nice, but the best part was getting to chat to everyone. In true (unspoken) Welsh tradition the heavens opened before we were all due to go back out on another loop. Undeterred we decided that it was probably best to go to the pump track and freeride area to mess around instead. Most of us just stood around watching Rachel and Dan show off their skills. Gee had to head off early to get things packed and ready for Red Bull Rampage, so he couldn’t join us for that bit, but it was great to meet him. There were some really fun bits in the freeride, some great drops and some big jumps with some technical features. Dan and Rachel made it look so easy, and we all watched them before heading back to the trail centre. We were all given a goody bag to take away from the day which was an added bonus. Then we got to grab a signed poster and a picture with Dan and Rachel, you could see how much everyone had enjoyed their day. The day was one I will never forget. I didn’t know what to expect but I learned new things and made some new friends. The trails at Llandegla were beautiful and I will most definitely give XC another go. I came away from the day having more respect for the Atherton’s and what they do; they were all lovely, humble and welcoming people. I never thought I would enjoy XC, but the people and the atmosphere made it a really enjoyable experience. All the guys I ride with were really jealous that I got to ride with the Atherton’s, and I feel so lucky to have been able to do so.